What’s better than kicking off your summer with one of your favorite publishing groups? Kicking off your summer with THREE of your favorite publishing groups! 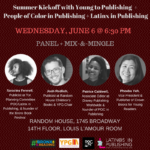 Join us for a panel and mix-and-mingle with the Young to Publishing Group, People of Color in Publishing, and Latinx in Publishing. We’ll chat about everything from what these groups do and how to get involved to how groups like these are paving the way for a publishing future we can all be proud to be part of. Panelists include Josh Redlich, Publicist at Random House Children’s Books and YPG Chair; Patrice Caldwell, Associate Editor at Disney Publishing Worldwide and founder of People of Color in Publishing, and Saraciea Fennell, Publicist at Tor, committee member for both POC and Latinx in Publishing, and founder of the Bronx Book Festival. The panel will be moderated by Phoebe Yeh, VP and Publisher of Crown Books for Young Readers. A mix-and-mingle will take place after the panel.